29-year-old Rhein Gibson has survived the tense season-ending Web.Com Tour Series to become the latest Australian to graduate to the PGA TOUR for the 2015/16 season. 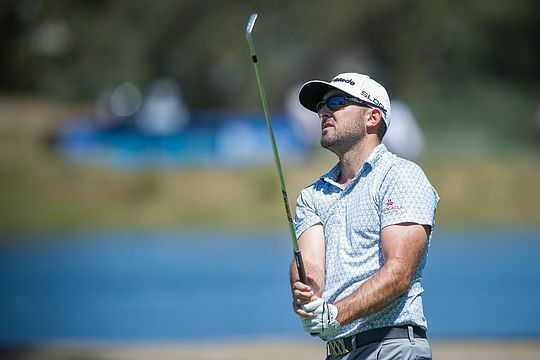 From Lismore in Northern NSW, via the U.S. collegiate system at Oklahoma Christian University, Gibson locked up his card with an impressive 4th place behind Emiliano Grillo of Argentina in Sunday’s final round of the Web.Com Tour Championship. Gibson led with an opening day 63 but wobbled with a six-over 76 on Friday, before firing consecutive rounds of 65-65 to finish at 11-under. He joins fellow graduate Rod Pampling, who had sealed his return courtesy of a Top 25 finish in the regular Web.Com Tour season ranking. Leading the class of 50 headed to the PGA TOUR are Patton Kizzire, who led the Web.com Tour in combined earnings for the entire 25-event season, and Chez Reavie, who was the leading money winner for the four-event Web.com Tour Finals. Both are fully exempt on TOUR and earned a spot in next May’s PLAYERS Championship. The 25th and last Finals’ money-list card went to Rob Oppenheim, by a mere $101. The 50 who secured 2015-16 PGA TOUR playing privileges were ranked in order from 1-50 which will indicate the order in which they will be slotted into the Web.com Tour eligibility ranking. Gibson’s result earned him place No. 20 in a group that included former U.S. Open champion Lucas Glover, former Tour winners Kyle Stanley, Dicky Pride and Steve Marino, Presidents Cup representative Anirban Lahiri and prolific Japan and European Tour winners Hiroshi Iwata and Thomas Aiken. Not so lucky were fellow Aussies Aaron Baddeley, Greg Chalmers, Steven Allan, Cameron Percy, Mat Goggin, Oliver Goss and Robert Allenby – most of whom will now be playing on the Web.Com Tour next season or chasing sponsor’s exemptions to play as many stops as they can on the main Tour. Allenby will be the exception as he will likely activate one of his two one-off career money exemption categories to remain on the PGA TOUR. The 2015/16 PGA TOUR commences in just two week’s time at the Frys.Com Open at the Silverado Country Club, in the wine country of Napa Valley, California.